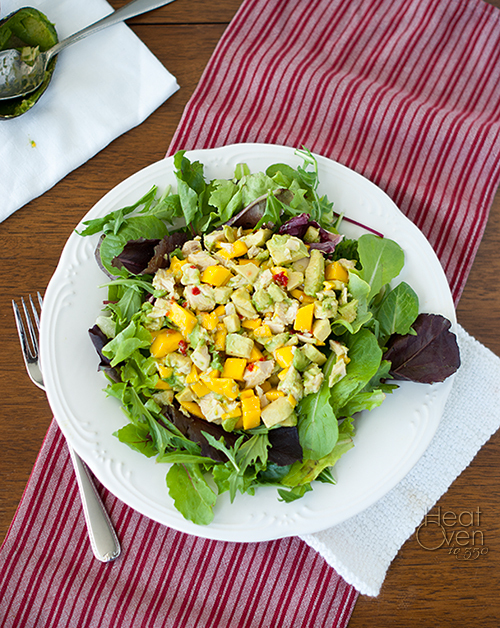 Mango and avocado make one of my favorite flavor combinations. There is something tropical and refreshing about it. With spring greens and chicken in a salad that refreshing flavor becomes an entire meal. A happy, tropical vacation meal. Especially when add on the simple tangy/sweet/spicy lime dressing. This salad says "summer" and "relaxing by the pool"and all kinds of wonderfully sunny things. It is light, healthy, and filling, and easy to make and it makes a perfect lunch or light dinner. Throw it together, eat it outside on the porch, and enjoy that summer is here. 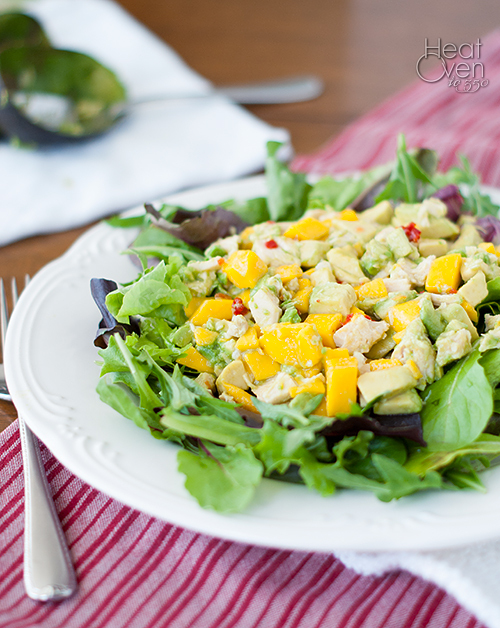 In a large bowl, gently toss together the chicken, mango and avocado. Add 2 tablespoons of the lime dressing and mix. Divide the lettuce among four plates, then top with chicken mixture. Pour dressing to taste over each plate and serve. This salad looks so fresh and delicious -- perfect for summer! I love mango with avocado. Pinning! Great minds! haha I made this salad some time ago with the intent to blog it, but never got around to it. I did review the recipe and add a photo to the one on AR though! Your salad looks WAY better than mine did! I did love the combo though! Mango and avocado do go so well together...i wish I wasn't allergic to mangoes (so unfair!) :( This sounds amazing. I made this last night and it was good but I would stir more salsa in as it seemed a little dry for us..but we love lots of salsa. I had a big group to feed so I made the chicken version and then I make a ground beef version...I substituted a pound of ground beef (I browned it with the onions/green peppers) for the chicken and a can of black beans (raised) for the corn. It was good also.